Sometimes I just don't like to cook. Last night was one of those nights. They were calling for a huge snow storm to hit the NOVA area, and it did, but last night I just wasn't in the mood to cook. 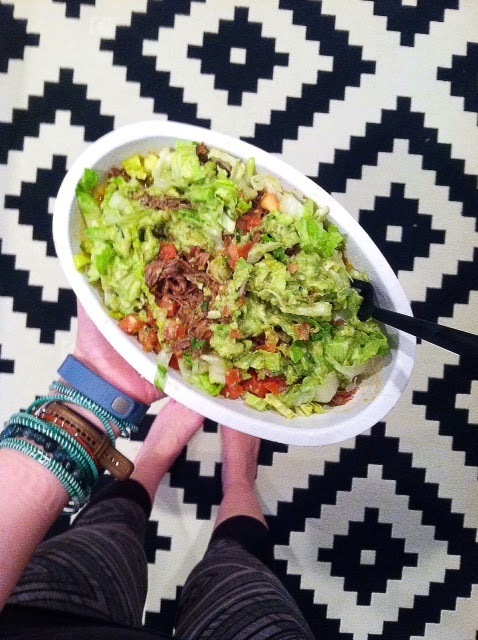 One of my favorite options when we eat out is Chipotle. I normally get the carintas in a bowl, extra meat, no rice or beans, guac, and pico. Right now Chipotle is searching for a new pork supplier that meets their food with integrity standards - you can find all the info here. Last night I opted for their barbacoa bowl without the beans and rice, but had to get the guac. I probably shouldn't have gotten the extra meat, it was so filling! Eating out shouldn't be hard, or stressful. Always ask if they can modify the dish to your diet needs.